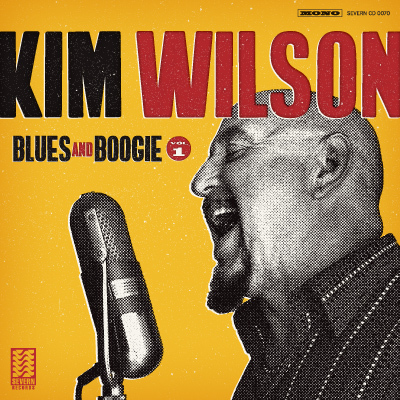 Legendary singer/harmonica master Kim Wilson has gone back to the basics and old school Chicago blues for his exciting new CD, Blues and Boogie, Vol. 1, coming October 20 from Severn Records. Blues and Boogie, Vol. 1 was produced by Kim Wilson, with most tracks recorded and mixed by Nathan James at Sacred Cat Studios, Oceanside, California; except tracks 4 and 15 recorded by Big Jon at Big Tone Recording Studios, Hayward, California. I am writing my own liner notes this time because I want to tell all of the real blues fans out there what a labor of love this project has been. I’ve been recording many, many tracks for a couple of years now and time has just flown by! A couple of the greatest musicians that ever lived, Richard Innes and Barrelhouse Chuck, have passed away during the process of making this album. One of their dreams was to see this stuff come out. So here it is, the first of many to come. This kind of music is very easy and pleasurable for me to perform. I like to surround myself with musicians who like to “fly by the seat of their pants“. People like Richard, Larry and Barrel, Billy Flynn, Big Jon Atkinson, Marty Dodson, Nathan James, Malachi Johnson and all of the other fantastic blues musicians who are on this album. I desired to record songs that I have always wanted to do. However, I have to put my own twist on everything.